If you have been faced with the loss of one or more adult teeth, either due to loss because of injury, tooth decay, or periodontal disease, you may have thought about, or been told by a dental professional to get, dentures. Believe it or not, it’s estimated that nearly 34 million Americans wear full or partial cosmetic dentures, so if you’re looking into them, you’re not alone. But you may have a ton of questions, so we’re here to help. Here is a general overview of the types available, as well as answers to help guide you in the world of dentures. 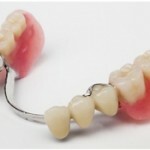 Dentures range from full dentures, immediate dentures, partial dentures, and overdentures. A full denture is made and placed in a patient’s mouth after remaining teeth are removed and the tissues in the mouth have healed, which can take up to several months. In the meantime, a complete denture (also known as an immediate denture) is inserted after the remaining teeth are removed, so you don’t have to be without teeth during the healing process. 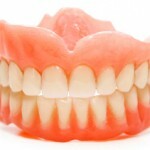 -What is an immediate denture? An immediate denture is a denture that has been created for you based off of the measurements taken by your dental care provider during the preliminary visit. The advantage of immediate dentures is that you do not have to be without teeth during the healing process. However, as gums will shrink after the initial healing, immediate dentures may require rebasing or relining to fit properly. 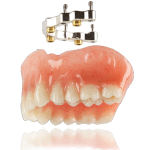 Once the healing is complete, a conventional denture, or full denture, can be made. Healing typically lasts between six to eight weeks. Partial dentures, also known as bridges, only take the place of a few teeth, and prevent the others from changing position. They usually consist of replacement teeth attached to a pink or gum-colored plastic base, which is connected by metal frame work that holds them in place. They are used when one or more natural teeth remain in the upper and lower jaw. – Can I eat and speak with my dentures in? With any oral mouthpiece, whether it is braces, retainers, or dentures, eating and speaking take a little adjusting to. In regards to eating, soft foods cut into small pieces will help you adjust to eating with them in. In regards to speaking, practice makes perfect. If you find certain words are troublesome, repeat them aloud and often. If your dentures create a clicking noise, speak a little slower. If problems with either persist, speak with your dental care provider and they can help. – How long should I wear them? Your dental care provider should give you instructions on how long to keep them in. During the initial period, you may be advised to wear them most of the time, including while sleeping. After the initial adjustment period, you may be instructed to take them out at night. Generally, it is not advised to wear them continuously, as your gum tissues need rest. – How do I clean them? 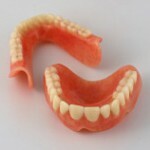 Dentures are delicate, and like natural teeth, must be brushed daily to remove food deposits and plaque. Your dental healthcare provider will recommend a cleanser that is appropriate to use for your dentures, paired with a soft bristled brush. – Will they need to be replaced? Overtime, dentures will need to be relined, rebased, or remade due to normal wear and tear. It is important to keep them in tip-top shape, as poorly fitting dentures can make chewing difficult, impede speech, change facial features, and cause general oral problems. – How often should I see my dentist? Your dental care provider will tell you when you should come in. Just like natural teeth, regular check-ups are important. – How much do dentures cost? Depending on where you live, and what your needs are will determine your denture costs. Typical costs range from $500 to $2,500; however, most dental insurance plans cover the majority of the costs and require very little out of pocket payment.